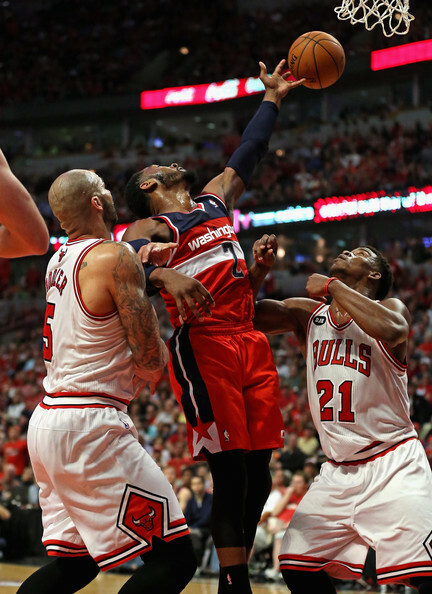 John Wall #2 of the Washington Wizards tries to rebound between Carlos Boozer #5 and Jimmy Butler #21 of the Chicago Bulls in Game One of the Eastern Conference Quarterfinals during the 2014 NBA Playoffs at the United Center on April 20, 2014 in Chicago, Illinois. The Wizards defeated the Bulls 102-93. NOTE TO USER: User expressly acknowledges and agrees that, by downloading and or using this photograph, User is consenting to the terms and conditions of the Getty Images License Agreement.